Très privé 4 chambres 5 acres front de mer de concepteur de maison en bois rond »Roadhouse Style 'avec des vues spectaculaires sur le lac Atlin. Cuisine ouverte, salon, salle à manger avec cheminée Rumford. 2ème Peintre / atelier de l'écrivain sur la propriété. Accès à l'eau et à 10 minutes à pied en ville. Merveilleuse escapade avec certains des meilleurs sites de pêche, randonnée pédestre et VTT du monde. Aéroport local, avec hélicoptère et en avion pour la location. Atlin a épiceries, galeries et cafés. Whitehorse, au Yukon, qui est un 2 heures de route au nord a toutes les commodités d'une grande ville. Juneau Alaska est un hydravion de 30 minutes en métro. Atlin est une ville de l'orpaillage historique entouré de miles de la nature dont une partie est du parc provincial. Un des plus grands champs glaciaires se trouve à l'extrémité sud du lac Atlin. Certains des meilleurs sites de pêche, le vélo, la randonnée et le canoë-kayak dans le monde. Everything about this house is perfect! The views are truly breathtaking! We have stayed in over 50 vacation rentals globally, nearly all in beautiful settings with gorgeous views, and yet the views from this home top the list! The owner is a couture fashion and home products designer, and her home reflects her talent as an artist. Every nook is interesting, and the furniture is also incredibly comfortable. We spent a month in beautiful homes on our trip to the Yukon, and this one also had by far the most comfortable bed. We spent 6 memorable days in Atlin and enjoyed its rural charm and the ability to hike so many places in complete privacy. 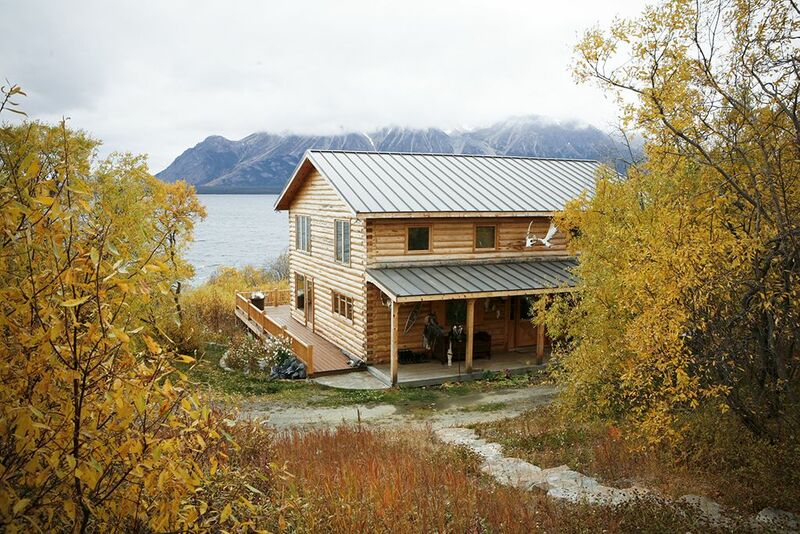 We really enjoyed our stay at this beautiful cabin with an amazing view of Atlin Lake from every room. Although just on the outskirts of Atlin the cabin was very secluded with no other homes or the road visible. The cabin very roomy, wonderfully decorated, but comfortable, and was fully equipped with everything we needed including wifi, children's toys, kayaks and bicycles. The one thing missing was a gas barbecue, which I expect the owner will rectify. We barbecued over the coals in the fire pit. Atlin is an interesting community, full of artists and outdoorsmen, surrounded by beautiful lakes, mountains, waterfalls and hot springs. We would highly recommend a float plane flight over the Llewellyn glacier and Juno ice fields. Our stay was wonderful! Atlin, BC is a delightful place. It has a unspoiled charm that is hard to find. The fishing was great. The lake beautiful beyond words and the house very comfortable. I would recommend this vacation rental to anyone but I think it is really well suited for a large family. Thank you to the owner who went beyond to make us feel welcome.